Quick: when was the last time the Access Integrated Development Enviroment (IDE) got a new feature? 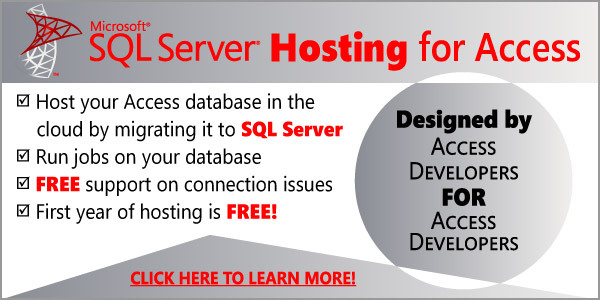 This month I’ll be discussing these ideas and more at our regular Access with SQL Server group meeting, to be held on Thursday February 15th, (note it will NOT be on our regular second Tuesday of the month), where I will welcome your suggestions and get the Access team to show some love to the IDE. The “new data connectors” link is broken. I definitely agree that the VBA IDE is painfully in need of an upgrade. However, you should note that the official position of the Access development team seems to be that comments on the IDE should be directed to the general MS Office team because the IDE is not an Access-specific feature. Isn’t Access’ IDE shared with the rest of the Office suite? Then you’d have to have the other applications to change their IDE as well, wouldn’t you? 2. Support for pivot tables/charts was removed , and it is a shame, put it back!